Maybe some may not be into recycled or upcycled jewelry. But others do and still more appreciate the eco-friendly nature of such adornment. The trick is to make these so you do not betray their humble origins. People will be amazed when you reveal what they are made from! One lovely example is the upcycled plastic bottle flower stud earrings tutorial by Ivalex. She just uses a candle flame to help soften the plastic enough to bend it. The inner petals were singed at the edges. I think she just sizes the holes of the punched flowers to be a tight fit on the studs (made from headpins). But a bit of glue will work. 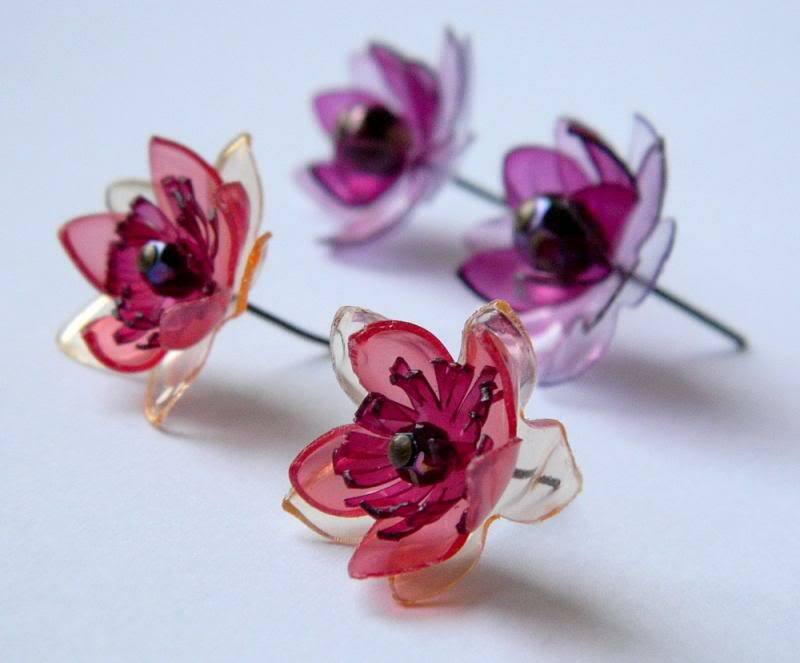 Or use little resin clay balls both front and back of the flowers so they will stick to the wire. The tutorial is in Bulgarian so you will need to translate it. Computer users : Use the Chrome browser, right click anywhere on the page and select "translate to English". Mobile device users : Download the Chrome app, add the URL. The app asks if you wish to translate. Now I'm wondering about the colours of plastic I put in the recycle bin without thinking of using them for something - like this!! Me, too! I have saved all kinds of pop and beer cans because of the colors. Now to save colored plastic bottles!! You are right about the sizing of the holes, Pearl - they are a tight fit :) With such pretty colors, it looks like the material was especially designed for these earrings!